Every iPhone and iPad user should be in the habit of regularly backing up their iOS device. One of the easiest ways to backup an iPhone or iPads with iCloud. 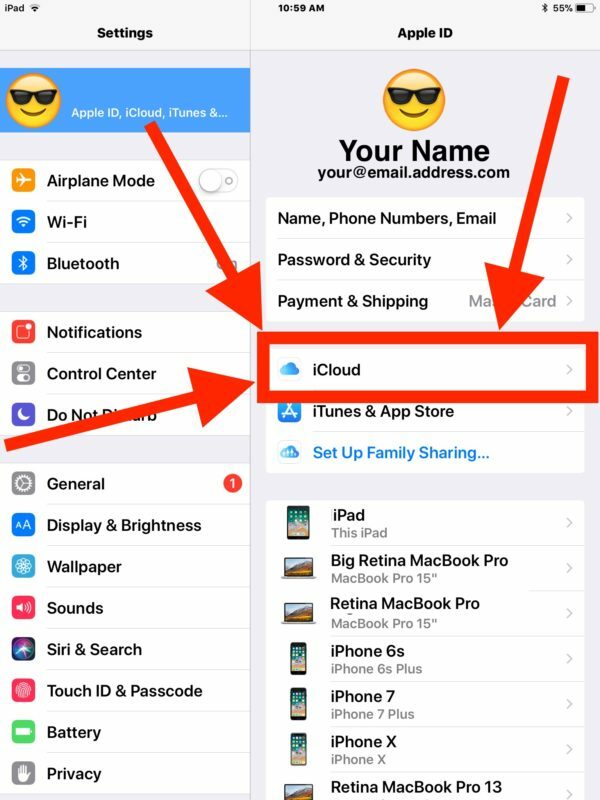 Many users are unfamiliar with the process of backing up iPhone or iPad to iCloud, but this tutorial aims to detail the entire process of insuring the backups for iCloud are enabled, and demonstrating how to initiate an immediate backup of the active iOS device to iCloud. This article will also answer some common questions about iCloud backups, including what iCloud is, what is backed up to iCloud, and when iCloud backups happen. Backing up an iPhone or iPad to iCloud is achieved via the Settings app on the device. The process is the same on both iPad and iPhone, though the settings look slightly different due to the different screen size of each device. See, backing up to iCloud is quite easy. The entire iCloud backup process of an iOS device is initiated from the iPhone or iPad with just a few taps. Now that you now how to backup to iCloud from an iPhone or iPad, you may want to know some answers to other common questions about iCloud and backups of iOS devices. What is an iCloud backup? Is it secure? What is backed up to iCloud? iCloud is the cloud data storage service from Apple, and iCloud backups are backups of your iPhone or iPad on remote servers hosted by Apple. All iCloud backups are encrypted and secured by default, and all iCloud backups are attached to the Apple ID in use with your Apple products. iCloud backups will include all data on the iPhone or iPad, including photos, notes, movies, account information, login details, documents, settings, preferences, and more. When does the iPhone or iPad backup to iCloud? 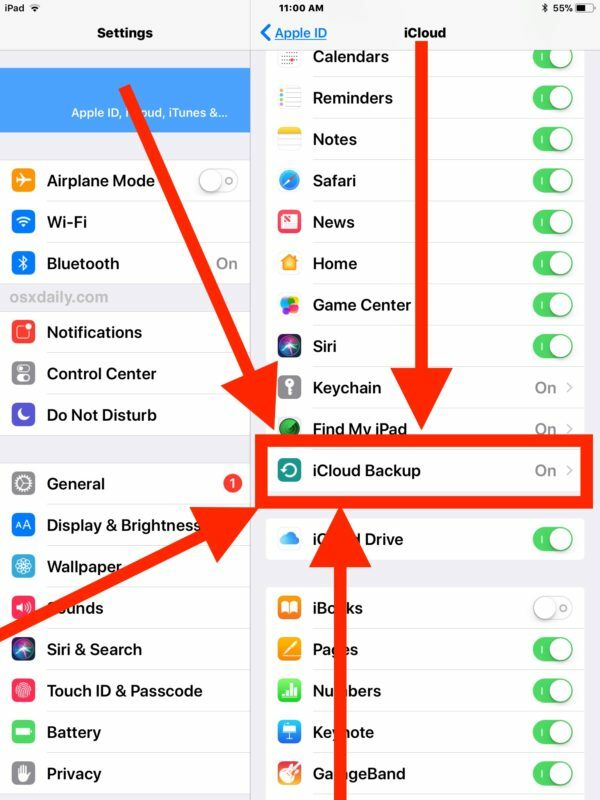 When you have iCloud backups enabled on an iPhone or iPad, the device will automatically back itself up to iCloud when the device is plugged in or charging, with the screen locked, and when connected to wi-fi. For example, if you’re connected to a home or office network and you leave your iPhone or iPad to charge overnight or during the day, it would backup automatically when it’s not in use. Additionally, you can initiate a manual backup to iCloud at any time. For example, you might want to backup to iCloud manually before starting an iOS software update on an iPhone or iPad, thus insuring you have a recent backup made in case the software update fails. How long do iCloud backups from iOS devices take to complete? iCloud backups can take a while to complete depending on internet connection speed, the size of the backup, how recently the device was backed up before the current backup, and how much stuff is on the iPhone or iPad and how much has changed. It’s not unusual for iCloud backups to take several hours if not longer, particularly for storage loaded iOS devices that have 64 GB, 128 GB, 256GB, or large amounts of data on the device. 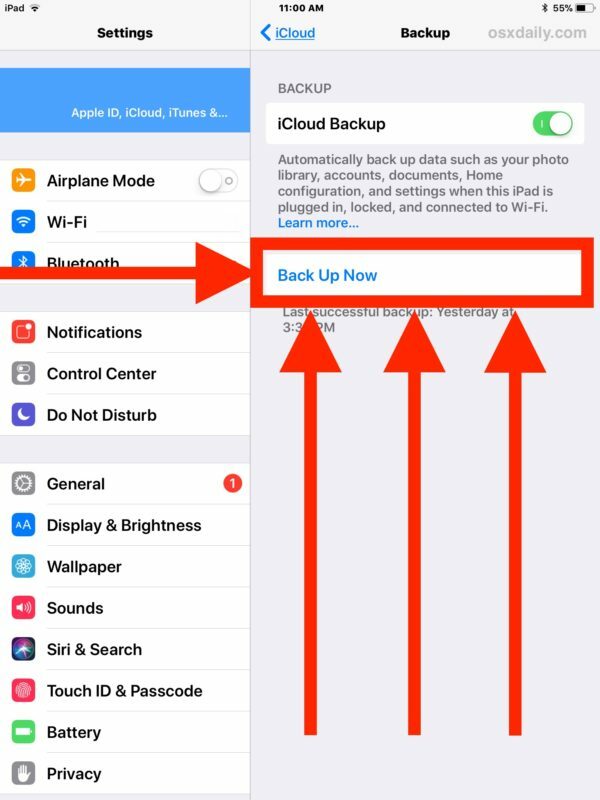 Keep in mind that an iCloud backup is literally uploading the data on the iPhone or iPad to iCloud, and thus the speed at which the data backup happens is dependent on the speed of the internet connection in use during device backups. For this reason, using iCloud to backup is best for users with reliable and ultra-fast high speed broadband internet connections, and it may not be a good backup solution for rural users or those with less speedy or reliable internet service. 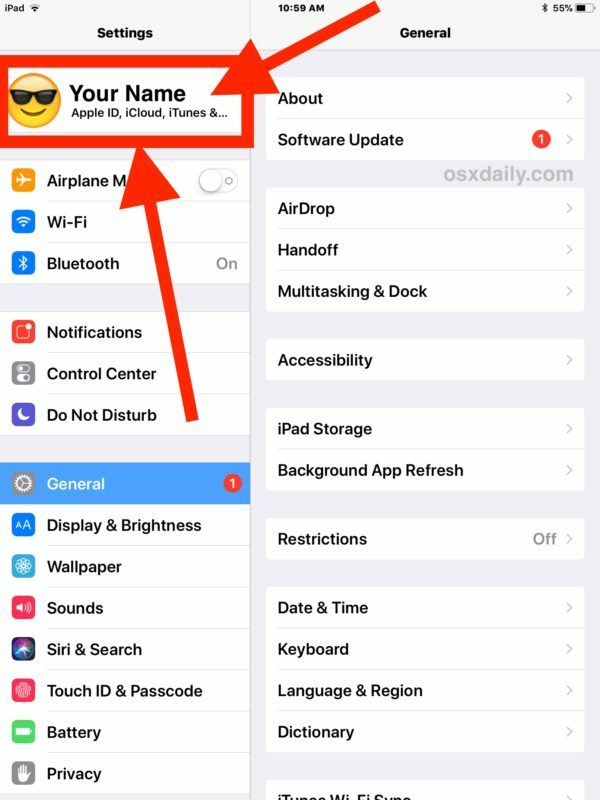 iOS users in these scenarios can turn to backing up an iPhone or iPad with iTunes and a computer instead. Is backing up to iCloud the same on all iOS versions? Yes all vaguely modern iOS versions support iCloud backups. Note that the steps above cover the most modern versions of iOS system software, where accessing iCloud Settings on iOS is now tucked behind the iOS users name, and perhaps not an obvious tap target or selection of options. Prior versions of iOS still support iCloud backups, but there is a separate “iCloud” section of the Settings app that is not tucked behind a button of your personal name. Aside from that, the backup process is identical. Can I backup multiple iOS devices to the same iCloud account? Yes. 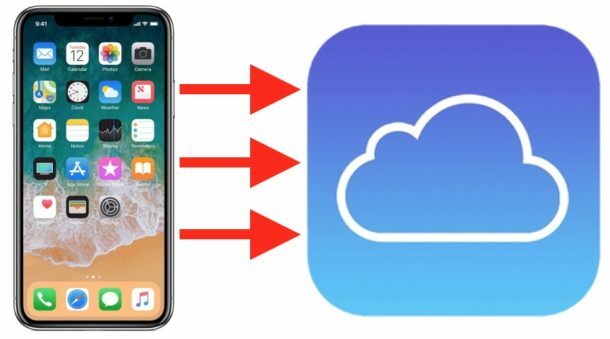 If you own an iPhone, and an iPad, or several iPhones or iPads, they can all backup to the same iCloud account. The only potential limitation is the storage capacity of the iCloud data plan. Users with multiple iOS devices will often find it necessary to pay a monthly fee to Apple for a larger iCloud data storage plan, since the default free 5 GB of iCloud storage capacity is often woefully inadequate for backing up data from iPhone or iPad models. Why backup to iCloud at all? Backing up to iCloud is easy, secure, and convenient. Backing up keeps your data secure and makes sure you never lose your photos, contacts, notes, personal data, and other important personalizations to an iPhone or iPad. Backing up an iPhone or iPad also allows you to easily restore an iOS device from the backup if you need to, and allows you to easily transfer and migrate data to a new iPhone or iPad if you get a new device. All of this represents strong support for backing up to iCloud, so be sure iCloud Backup is enabled and that you backup a device before updating any iOS system software.